PLEASE CLICK HERE FOR A LINK TO OUR CLEARANCE LIST - Lakeland Supply Inc. 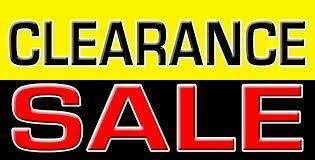 Please click the Document/Specification link below for a list of Clearance items. For your convenience, this list is organized by category of product, so like items are listed together. This list is updated on a regular basis, but due to the nature of these items being on clearance, the quantities are limited and will be sold on a first-come, first-served basis. Please contact customer service at 262-549-6800 to check availability and to order products on the Clearance List.